Disqus not appearing on your blog? First you'll want to verify that you've entered the correct shortname within the Appearance settings. Note that a space or uppercase letters will conflict with Disqus functioning properly. If your theme doesn't have a shortname setting or has been coded incorrectly, you'll want to using our Manual Installation Instructions. If you're already using the manual installation instructions, please be sure to remove the "<" and ">" from either side of your shortname. These customizations require an advanced understanding of HTML and may differ among Tumblr themes. Disqus not appearing on your mobile device? Disqus doesn't load in Tumblr's optimized mobile layout. 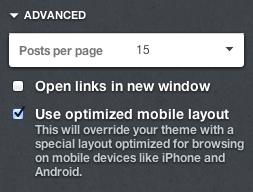 You can disable the mobile layout by unchecking Customize > Advanced > "Use optimized layout on mobile devices".